“There is always something burning,” I said. Drew wondered if the ominous nebula percolating between the buildings could be from the demonstration. When we saw a masked figure wheeling a dumpster toward the flashpoint, some neighbors had suggested an alternative route from the check-point. Then, a sensation like the sting of a thousand onions being shredded by power saws overwhelmed our eyes. I tried to laugh as the burn spread to my mouth and up my nose but, even at that distance, the fall-out from the tear-gas was miserable. We thumbed a ride to the next corner. I harkened to the sound of stones striking against the concrete Wall and guard-tower in the distance. 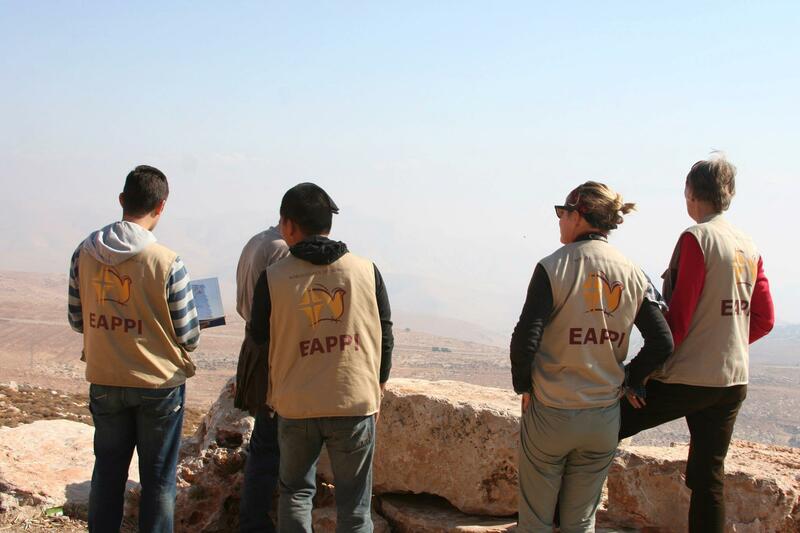 Members of EAPPI stationed in Yanoun, Bethlehem, and Yatta look out over the Jordan Valley. was unnerved to my core and yet uncannily touched by the simple beauty of owls calling to each other from centuries-old olive trees. I felt I could be whole again but there were no guarantees. Then Gaza was attacked. Yanoun evaporated and I ignited. Twitter became my life-line for everything important, everything that mattered to my heart, as I selected a generous roster of journalists to follow, foraging for articles to read and repost at regular intervals into the night. Solidarity makes me a wraith: why should I have the right to rest? It is difficult to tell myself “I need quiet” when the voices shouting from my depths say “the world must know!” With all of my fuel lines plugged in (tea, music, media) I hovered for hours, then burrowed into my bed as if it were the chrysalis that turns edgy missionaries into peace-gurus. I awake as myself, every day. Meanwhile, my better sense is objecting to the cycle of push and crash. The signs were there long before the trip to Yanoun, the retreat in Jericho, or the day picking olives in Beit Jala. The first signs may have been my trembling hands, eating a sandwich with lady IOF soldiers who thought I was going to Haifa. Arguably, the writing was on the wall one winter day in Grand Rapids Michigan when I started lecturing my soapy dishes about divestment. I needed this Calling but I will be forced to examine my deficits again when the steam that fills my core cools, condenses, and runs away. over Nagasaki in Hiroshima’s wake. fire upon the trapped people of Gaza. The technique must be key, though I make sure never to be around. 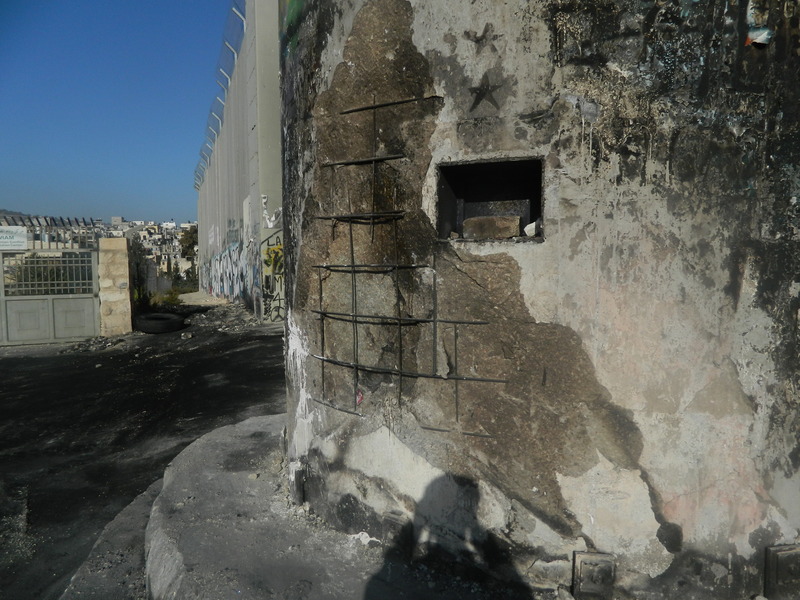 One morning, a huge bite was missing from the charred base of the guard-tower by the big gate in the annexation wall. The heaps of smoking trash and tires had already been swept away by municipal workers in small earth-movers but the asphalt remained stained black and the air still smelled of gas and gas: kerosene from below and mace from above. All of the US tax money, poured-out solid and gray, becomes brittle when exposed to fire. The youth will first come in waves, running forward with kefiahs over their faces to cast a barrage of stones. Each stone whispers something just before it hits the fiberglass shield: “we are David and you are Goliath. We are the rightful inhabitants and you are the monstrous, foreign invader.” The soldiers have nothing but their orders: their society handed them cocktail after cocktail of pride and cowardice throughout childhood. When the stones fly they follow procedure, shooting rocket-propelled tear-gas. The stinking nebula is designed to push back and quell the indigenous voices but instead it provides cover as more masked protestors come forward with accelerants and pre-lit dumpsters. After a while, they dissipate to let the purifying flames take their toll. Then, another wave comes with old pipes and batters the foot of the tower down to the rebar. They cannot quite punch a hole, yet. 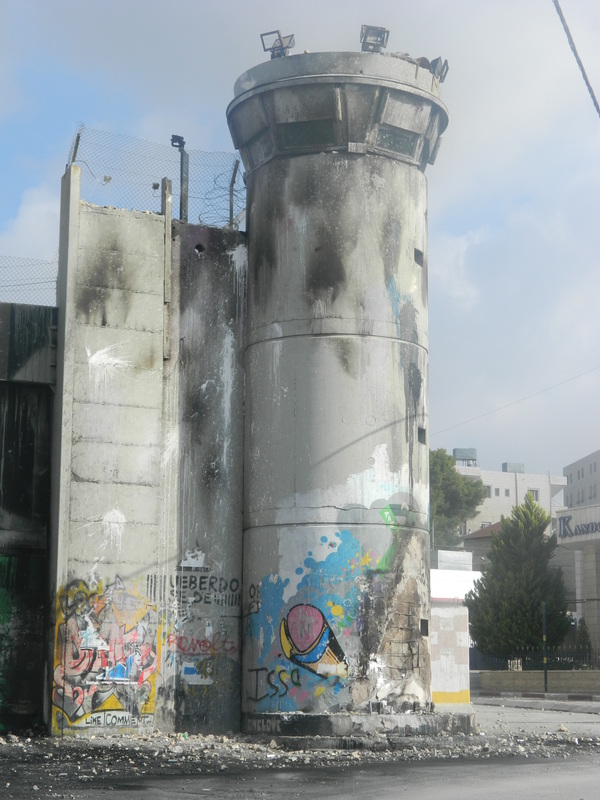 Call Ahava: we need some illegal cosmetics for this illegal wall! 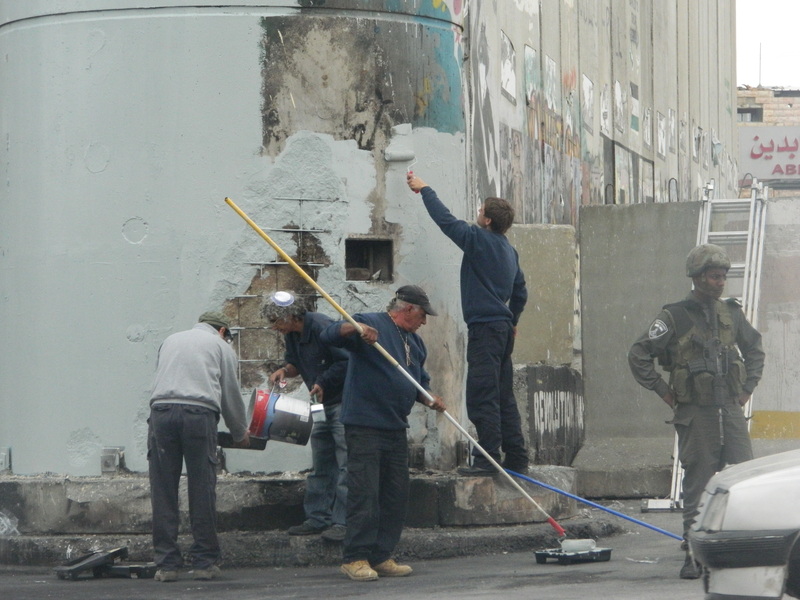 Within 24 hours of the ceasefire agreement, Israel laid the cosmetic foundations. They installed new barricades that slowed traffic and painted the burn marks with a bluish gray the color of sleeping Western skies in the early morning: backs turned to the sunrise. Yet the latticework of rebar remained exposed in the tower’s deepening scar, almost invisible for being that same, dull blue. Hi Daniel! I am a United Methodist pastor who is also (trying- the last few months we haven’t been as active as I would like) to run a UM young adult justice-focused blog connected to MFSA. I think it is so important we talk about peace and Palestine, and we’ve had Emily from Kairos response blog for us before, as well as another Mission Intern (David). I would love if you could write us a Christmas blog (or really a blog anytime, or crossposting, whatever). If you are interested, or just want to talk, please email me shasullivan@gmail.com. Thank you so much!